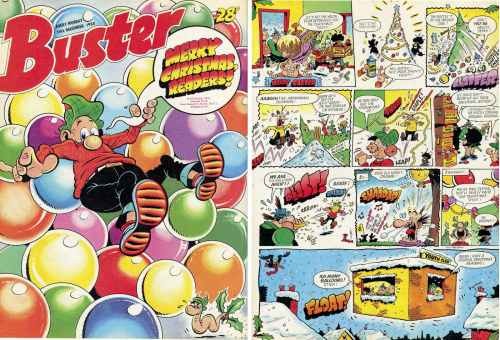 TOM PATERSON is a Scottish comic artist who drew characters for Fleetway in 1973–1990, and D.C Thomson from 1986-onwards. He lives in Leith, with three kids, and is a Hearts supporter. Taking stylistic inspiration from Leo Baxendale’s work on The Bash Street Kids, Paterson’s talent as a cartoonist was discovered at the age of sixteen by original Dandy editor Albert Barnes, who was impressed with the cartoon samples Paterson had sent to him. Barnes offered the young artist a chance to collaborate with him on a strip called The Dangerous Dumplings (which would later be retooled as The Doyle Family for the Dandy), which was to become the leading strip of a new comic Barnes was developing, but the project was scrapped when Barnes retired and Paterson has hired to work for IPC after leaving school. Many of his comic strips feature a single, striped sock standing upright on the ground that appears once in each story that acts as a trademark. He is currently drawing for Viz and his work appeared in Jamie Smart’s Moose Kid Comics. Brain Duane was a comic strip in The Dandy. It was about a nerdy bald inventor whose inventions would always go wrong. It was drawn by Tom Paterson between 1997-2005 before it was taken over by Duncan Scott. The strip disappeared when the comic became Dandy Xtreme. He returned in the 2012 Dandy Annual drawn by Steve Beckett. He was one of the characters featured in the PC game, Beanotown Racing. Anybody familiar with British comics will of course know the name Tom Paterson, and would probably recognise his trademark smelly sock. Tom is currently selling some of the original artwork he produced, which includes everything from front covers of Buster comic to more recent Dennis the Menace strips. Tom’s highly detailed pages are a treat to the eye and it often takes multiple reads to spot everything hidden in, and sometimes even outside, the panels. A black and white page costs between £100 – £150, or you can grab yourself a full-colour one for £200 – £225.